Image: The drill bit positioned over the CheMin inlet as part of the new FEST drop-off technique. Every single day that the Curiosity team gets to go into work and operate a one-ton rover on the surface of Mars is a good day. But last Friday was not just your typical good day -- it was a very, very, very good day. In my personal opinion, it was probably one of the top five most excellent planning days we've had on the mission to date. Early Friday morning we learned that the Feed Extended Sample Transfer (FEST) drop-off of the "Duluth" drill sample to CheMin worked. This means we had enough rock powder in the instrument to measure its mineralogy. Most importantly, now that we've demonstrated this critical step on Mars, the team can officially say that Curiosity's drilling and sample transfer capabilities have been restored. This represents a huge accomplishment for the tireless engineers who've worked over a year to learn to operate the vehicle in a way it was never designed to work. It's also an extremely exciting time for the science team, as we are eager to learn the key information CheMin and SAM will provide and further unravel the history of Gale Crater. The scientists and engineers at JPL celebrated this accomplishment with a joyous afternoon cookie break. 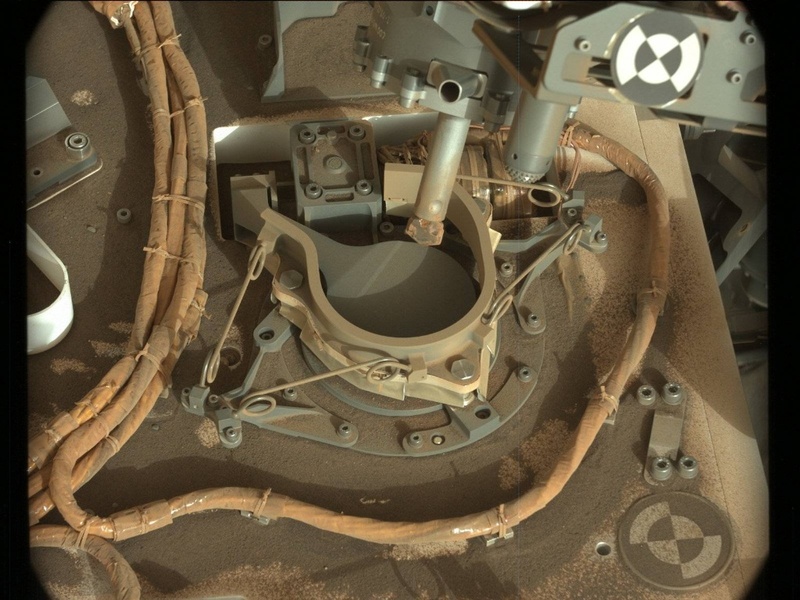 We will continue our Duluth drill sample analysis activities in the sol 2070-2072 plan. Since we now know we have successfully delivered to CheMin, SAM is up next. Our main activity for the weekend plan was a preconditioning of SAM and the sample dropoff using the FEST technique. We also squeezed in some remote sensing science of our local area. On sol 2070 we planned to acquire ChemCam LIBS observations of targets named "Little Marais" and "Bartlett," and a Mastcam change detection image of an area where we dropped a previous portion of the drill sample on the ground. We also planned to take a Mastcam tau (dust monitoring) observation on sol 2070, followed up with a Navcam dust devil movie, dust devil survey, and suprahorizon and zenith movies on sol 2071.